WEMO has introduced a new production line for manufacturing Steel Doors – a superior production line full of advanced technology in an elegant design. With its numerous add-ons, this line will change the way you work, turning dreams into reality. Automated sheet metal processing for the manufacture of Steel Doors. The PBL-2550 is suitable for manufacturing steel domestic doors, fire-resistant doors and industrial doors made from steel and pre-coated steel. It offers you the chance to produce doors with or without embossing in a variety of sheet thicknesses and types of material, enabling the manufacture of a wide range of doors to keep up with changing customer demands. Our ground-breaking production lines achieve a high output of up to 2 steel doors per minute, so you can cut your delivery times and costs per product. And to top things off, the high degree of automation ensures sublime quality for your products. Essential add-ons to make the most of your production process. 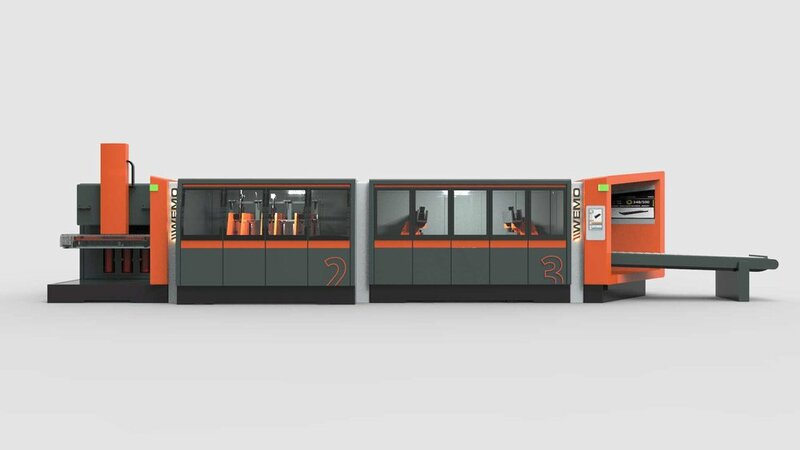 With its numerous add-ons, this flexible production line will change the way you work. The standardised modular options create a unique line so you can do whatever you need. Put something in and get even more out. This storage system is ideal for production processes with a batch size of one. It uses four feed systems to supply the material to the production line. Add Automated Guided Vehicles to this and you have an impressive combination at your disposal, with fully automated supply and removal of materials so no operator is required. The result: continuous production at full speed with considerable savings on manpower. When flexibility is an important part of your production process, it’s essential that you can punch and bend your materials, for example when you need to add holes or notches. This precision technology produces precision manufacturing like never before. Exceptional products demand expert production, and the most characteristic part of your steel door is its shape. The PBL-2550 can therefore bend 3-sided as standard. Sometimes, however, even greater flexibility is required. Thankfully, our modular scalability means you can easily expand this to 4-sided bending. This module makes child’s play out of perpendicular steel cutting, so you can benefit from buying steel for less while still guaranteeing the quality of your products. At WEMO, we call this cutting-edge technology. Automated Guided Vehicles (AGVs) can take your doors to the next stage of the production process with full autonomy. This speeds the process up as it means pallets can be moved without the need for a forklift or pallet truck operator. Combine this with your sheet metal storage system, and your loading/unloading process is fully automated. And then there’s this: the unrivalled production lines from WEMO represent high quality, optimal ease of use and efficient production. They can also be supplied with reinforced casing – resulting in noise reduction, easy access for maintenance work and optimal safety for your operators – making the line even safer and better to use. Need help? The Remote Assistance app puts your operator in direct contact with WEMO experts. 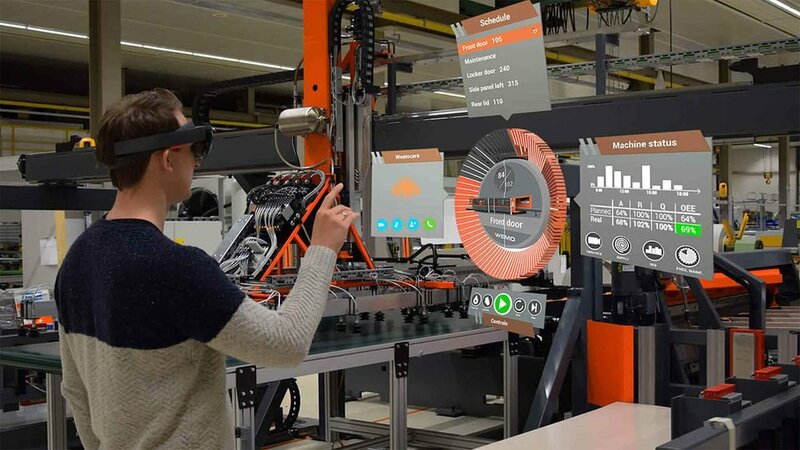 Our service employees can use an AR headset to view your situation in real time, making it easier to trace and resolve the causes of any faults faster than ever before. We’re always improving our own standards, and so also the whole industry’s. Our advanced software – LEAN 4.0 – includes a complete package of powerful features, giving your operator the possibility to see and understand primary processes. At the same time, you also receive intelligent insights into production reliability, costs per product, material consumption, quality standards, production figures and more. Future-proof? Get to know our new panel bending line. Request a demo now.